A full-cast dramatisation of Robert Graves' brilliant account of the madness and debauchery of ancient Rome, starring Tom Goodman Hill as Claudius and Derek Jacobi as Augustus. The wickedly entertaining inside story of the lives and deaths of the Imperial dynasty from Augustus to Caligula is told by their obscure relation, Claudius. In public, Claudius is a stammering, drooling weakling, whose reputation as an idiot keeps him safe from office and assassination. But in private, he's as sharp as they come, and keeps a secret history of everything he discovers. Until one day, as one of the few of his family left alive, he's acclaimed Emperor against his will. Can he save Rome from the corruption he's grown to detest? As a great fan of the books and the BBC adaptation for television, it was with some trepidation that I allocated last month's credit to an 'abridged' title. Lured by the presence of Derek Jacobi, a man marred only by his crackpot views on the authorship of Shakespeare's body of work, I was once again transported to Robert Graves' version of first century Rome. The voice-acting was superb, and I was only occasionally saddened that this or that part was missing. Mostly, I was having far too good a time to notice. Thanks very much for having this wonderful performance in your catalogue. What made the experience of listening to I, Claudius (Dramatised) the most enjoyable? Unbeatable recording. Every nuance of the language and affliction is audible and extremely well executed. A completely immersing ride. There are times, when I didn't want the traffic to clear. What did you love best about I, Claudius (Dramatised)? About to take my first trip to Rome, I chose this to get myself into the mood. It was a wonderful experience listening to these actors perform. I've never seen the PBS series, but I could picture it just listening to this performance of I, Claudius. Have you listened to any of Derek Jacobi and Tom Goodman Hill ’s other performances before? How does this one compare? I'm a big fan of Derek Jacobi and I wish he had a larger part in this. I listened to this book over several weeks. It's an easy book for car listening. 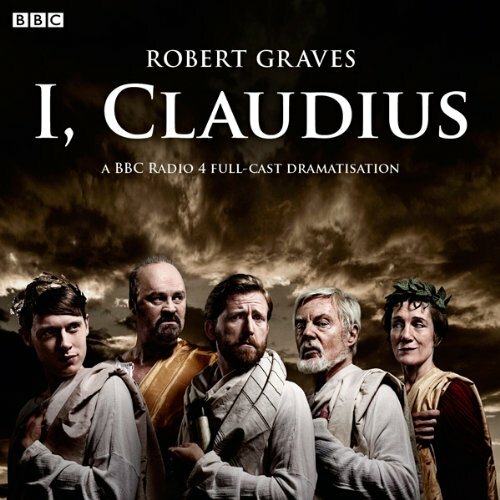 As a fan of both the book and the classic BBC TV miniseries starring Derek Jacobi, I couldn't resist trying out this audio drama version of I, Claudius--especially as it stars some of the great British theater actors, including Jacobi as Augustus, and it recently won an Audie Award for full cast recordings. What a great piece of audio theater it was! I was so drawn into the story, the characters, and the life of the early Roman Empire that I literally couldn't stop listening. (Since I normally listen as I walk, this was also quite good for my figure!) You find you don't miss the visual element at all--each character is clearly separate and your imagination paints the scene. Great story, great acting--who could ask for more? Performance was wonderful and the story is compelling! This book is treasure and the performance holds your interest. Seriously enjoyable performance of this classic. I would listen to it when I had any opportunity - in the car or waiting for a shave at the local barber. Completed in three days. Highly recommended. I missed my subway stop more than once because of this one, but if it took longer to walk home, I wasn't the least bit upset. I thought about this book while at work and was completely pre-occupied. I'd seen the TV series videos, so I knew what to expect but I think I was more engrossed with the audiobook than the TV show. It's so hard to explain. Derek Jacobi stands out, really bringing to life a vulnerable but deeply intelligent Claudius. Words fail. The BBC television production of I, Claudius is one of my favorite miniseries so this recent radio production had a lot to live up to. Happily it manages to feel sufficiently distinctive and does an excellent job with the source material, dividing the material up quite neatly. The performances are universally excellent and the decision to cast Jacobi as Augustus is clever both in terms of the nod to the past and in his different interpretation of that role. Excellent for fans of radio drama or those with an interest in early imperial Rome. If you loved the TV series, you'll also love this. The voice of Claudius is not Derek Jacobi, but that's of no concern, because he sounds very similar and his stuttering skill is identical. You might even be surprised to learn it's not Jacobi's voice. You will feel comfortable and happy about the Claudius voice. Derek Jacobi himself does a short stint in the story as Augustus, and does not sound like Claudius from the show, but like Augustus (go figure). Some things are a little different than the show but in an interesting way. That is, they add info to the situations that made me think these bits of info were supposed to be part of the show but were cut. Anyway, the facts work nicely into the facts from the show. The music was fitting and the cast superb; it was just a good time revisiting our old friend Claudius from the series. The casting, the acting, the plot, the language, the music, the pace - everything was superb. I also loved that male and female characters were played by actors with corresponding voices, as well as the fact that many of the voice actors were part of the BBC production of I, Claudius, making them extremely familiar with the characters they were portraying. What was one of the most memorable moments of I, Claudius (Dramatised)? Aside from Hill and Jacobi's masterful acting, the detail that stuck with me the most of Caligula's character. The way he was introduced, developed and portrayed, as well as the shocking revelation about the fate of his father Germanicus all left a lasting impression on me. Definitely worth listening just for this! What about Derek Jacobi and Tom Goodman Hill ’s performance did you like? As someone who has not watched the TV series, I can say that Derek Jacobi's performance was solid, but Tom Goodman Hill blew my mind with how authentic and pitiful his Claudius came across. Amazing acting that made me relate to the character despite his very ostentatious flaws.